Some dogs prefer to be the sole animal in a household. They don't want to be around cats or other dogs and they even may find small children to be annoying. When that's the case, the same usually also goes for rabbits, chickens, birds, and any other animal creature that could possibly live alongside people! However, there are lots of dogs who absolutely love and adore having other pet companions around. They thrive off the constant company and enjoy always having someone else to play around or cuddle up with. That's exactly how the dog in this funny video clip feels, but out of all the possible pets his owner could get him, he only has eyes for one. He has his heart set on an adorable fuzzy kitten and a sweet little tabby cat sister would be the absolute perfect addition to his life! 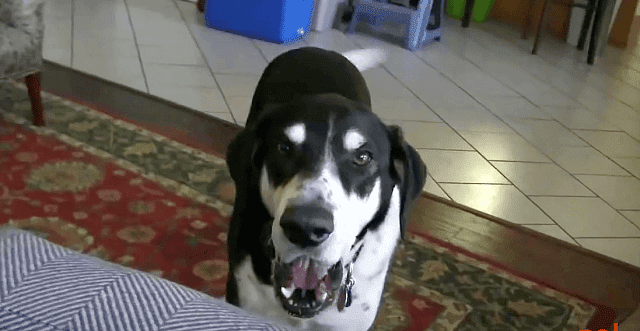 The hilarious clip of the black and white dog talking excitedly about finally getting a new cat has already captured the hearts of over six million people and it's easy to see why. The dog was given a voice courtesy of his owner and it's spot on in terms of his actions, words, and mouth movement! The pair hold a quite an interesting conversation and if you've ever talked to your pet, all this may look and sound familiar to you. The silly voice works great and you just have to see and hear it for yourself so check it out and enjoy!